The mountains in the Lake District, which you will also see referred to as the ‘Cumbrian Mountains’ and, more commonly, the ‘Lakeland Fells’ are part of what makes the landscape so captivating. Every year, thousands of walkers, climbers and hikers flock to the valleys and slopes to enjoy breathtaking views and invigorating walks. In total, there are over 900 square miles of Lake District slopes and lakes to enjoy, depending on what type of visit you want to have and your level of fitness and physical capabilities. Here is a comprehensive guide to the Lake District mountains to help you learn more about this beautiful area and plan your trip accordingly. 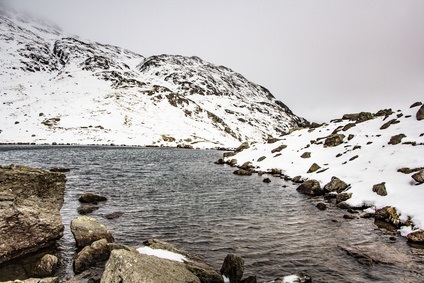 The word ‘fell’ is from Old Norse, and refers to both mountain ranges and hills; in the Lake District it is used to describe high areas of land used for grazing. Visitors to the area will notice that the word crops up in both the names of the mountains and place-names in Cumbria. There are four mountains in the Lake District that are over 3000 feet high: Scafell, Scafell Pike, Helvellyn and Skiddaw. 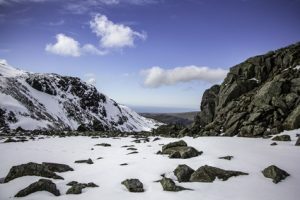 As well as this, there are dozens of other mountains and fells that offer different viewpoints and an array of different treks and paths to enjoy. This impressive mountain is the tallest in England, with the highest peak reaching 3,210 feet above sea level. Scafell Pike is located on the western side of the circle of mountains that sits in the Lake District National Park. With breathtaking views of crystal-clear water and lush green hills, this is one of the top destinations in the Lakes, with thousands of visitors flocking to its slopes every year. The climb to the top is not for the faint-hearted, and involves scrambling over rough terrains, which can become more complicated in seasons with more extreme weather. Scafell Pike has three different routes that can be followed to reach its top, so make sure you can read a map and compass to navigate to the top without getting lost. Skiddaw’s highest point sits at 3,054 feet. This mountain is situated to the north of Keswick and offers a straightforward route for walkers who wish to reach the summit. This mountain is distinct for its picturesque form and crisp, flowing lines – the perfect postcard mountain. 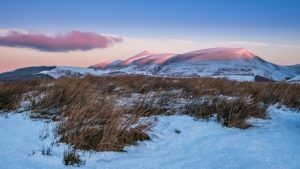 Skiddaw also differs from its neighbouring mountains because it is relatively detached and stands alone on the horizon, making it a popular destination for hikers and mountain climbers of all levels. Jenkin Hill Path is the most popular route up Skiddaw, due to its consistency and the beautiful views offered along the way. 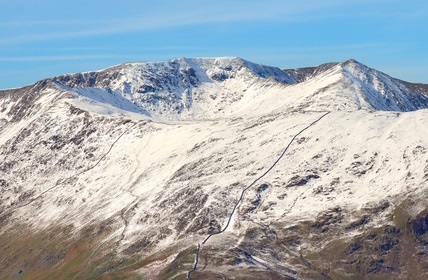 Helvellyn is typical of the Lake District Mountains. The western side is covered in lush slopes, heather and the occasional smattering of rocks, with a steady incline towards the lake the bottom; the eastern side, on the other hand, is craggy and rocky – the ultimate combination mountain whether you’re a novice in walking or an experienced rock climber, Helvellyn offers beautiful views and a range of different route types. 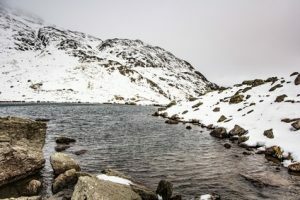 Striding Edge and Swirral Edge are two of the most famous routes to the summit, the former being the more challenging of the two. Walk from Patterdale village onwards to Grisedale and Grisedale Tarn and continue along the route to Helvellyn. Visitors enjoy this route for the consistent terrain and the impressive views of the eastern rockiness of the mountain. 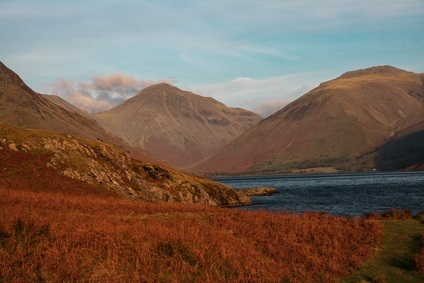 This mountain takes its name from its resemblance to a pyramid when viewed from the parish of Wasdale. Climbers and walkers enjoy this particular mountain for its stunning views of four Lakeland valleys. The route is better suited to experienced walkers and climbers as it is very steep in parts and quite craggy and uneven in places. The climb is consistently steep all the way to the top, so climbers need to make sure they have adequate equipment and supplies and most importantly, comfortable, high-quality walking boots. Located in the Furness Fells area, the Old Man of Coniston is another popular destination for walkers. It encompasses beautiful natural ruggedness with crags and green slopes, as well as historical mining sites and man-made fissures that tell the fascinating story of the copper mining and slate quarry culture in the region. The Old Man of Coniston can be ascended via Coniston village, with a carpark at around 230m. After this, there is no vehicular access so walkers should prepare themselves for an unassisted climb. There are many mountains within the Lake District to explore and discover, for both experienced climbers and casual walkers who appreciate a good view. Whichever you choose to climb, stay safe and carry the right gear and you’re sure to enjoy the peerless views of Cumbria without any hitches.